Every business today uses IT and telecom in some form or other. Managing their expenses is the real challenge. Have you ever realized the significance of telecom in your business and the need for having a good telecom expense management strategy? The New Year has already begun and there’s no better time than now to implement a TEM strategy for your organization. It’s common to get caught in the traps of telecom technology but it doesn’t necessarily mean that you must pay unreasonable charges for what you’re using. Telecom service providers often produce service contracts that have favorable terms only for themselves. Services in such contracts are difficult to understand and negotiate, which makes it tough for users to gain the upper hand. However, it’s certainly possible to optimize your telecom expenses without compromising on the essentials. There are plenty of ways you can streamline and optimize telecom costs in real time. Here are 8 great ways to start to increase your profits. Before everything else, it’s important to understand what your telecom invoice says and nothing helps you better here than deep research. Understand all the terms, acronyms, and jargons used in the invoice to get a better idea of your telecom costs. Once you completely grasp the invoice, the next step is to figure out what expenses you can cut. Regular audit of telecom helps you discover loose ends so that you can further decide what to cut. A legitimate audit from time to time is a sign that you’re on the right track to telecom optimization. This is probably the best way to move towards optimized telecom expenses. Careful administration of the available assets and monitoring of data usage heightens your awareness of each detail and ultimately determine what is being wasted, and thus should be simply eliminated. While this may not seem practical, it is real. Once you start monitoring data, it becomes easy to limit the usage. Rearrange or combine data and try to cut down on excessive usage, and all those things that appear to make costs go up. Grouping simplifies optimization. When your invoices are broken down into groups, it helps you optimize the costs more efficiently. By differentiating all sections, you can trim some fat out for the sake of cost optimization. It’s essential to upgrade to a new technology and services from time to time, including software. Providers will not be calling you to announce new promotional offers. If you want to get more efficient and save more on telecom costs this is the easiest way to assure you’re receiving the best deals available at that time. Whenever possible, it’s better to combine as many services as you can. Consolidation helps reduce expenses. Moreover, it ensures that your organization is not using any redundant services. This is a big one, compare providers. Switching to the telecom provider that offers better monthly or annual packages specifically aligned to your business goals will be the smartest step. 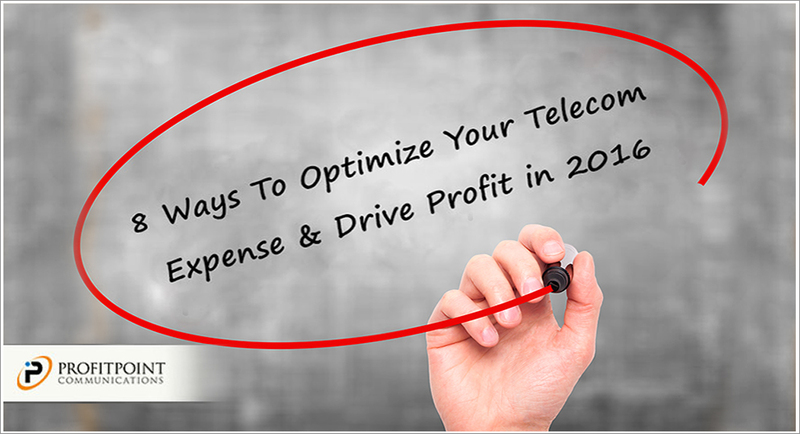 Using an optimized telecom cost management solution will bring in several benefits to your business to eventually drive better profit in 2016.